The children of Israel were given strict directions when choosing a sacrifice for the Passover. They had to choose a first year male goat or sheep, without blemish on the tenth day of the month. Then they had to keep it until the fourteenth day before they were to kill it that evening. Next they were told how to apply it to their doorframe. Strict orders were also given on how to eat and dispose of the sacrifice. Even their dress code and speed at which they ate were dictated to them. Today a sacrifice for sin is still needed. Unlike the Israelites, none of the pressure of securing a perfect sacrifice is laid on us. Jesus was the perfect Lamb chosen by God. Jesus came to this earth as the firstborn Son of God and of Mary. He came without spot or blemish and died after living a perfect and sinless life. He met all of the requirements of a perfect sacrifice. God’s choice was perfect. But, just like the Israelites, we are responsible for what we do with the sacrifice once it has been offered. We have to choose to apply the blood of Jesus to our life. After that He will gladly lead and guide us in every detail of our life if we surrender it to Him. How grateful we should be that our perfect Lamb has already been chosen and sacrificed. All we had to do was accept it. Throughout the bible there are many references to strong friendships. David and Jonathan. Ruth and Naomi. Paul and Timothy. Strong friendships all have a common ground on which they are sustained. If a person suffers a setback a good friend will help them get back on their feet. If a person is in need of comfort a good friend will comfort them. And if a person finds their self in the middle of conflict a good friend will help them to fight the battle. The friendships that can withstand tests not only has these qualities but most importantly and above all else the people within these friendships are intertwined with Jesus. Because Jesus is the ultimate friend. He will always help you back up. He provides peace that passeth all understanding. And he will fight your battles for you. Building strong friendships require time, effort and vulnerability. But they are worth the price. Make sure Jesus is at the core of the friendships that you are giving yourself to. Jesus had died the death of the cross. His body was at Golgotha’s hill. Joseph, a follower of Christ, was said to have “craved the body of Jesus”. to ask if he could take the body of Jesus. Joseph, out of love, honor and respect for The Lord risked his reputation, his life, to love Christ. Is your craving for Christ this powerful within you? Are you willing to risk whatever need be to show the world, to show Jesus, that you love Him more than you love yourself? Jesus had such a craving to be with you. He showed the world his love for you when he gave himself to be crucified in your place. Streets of gold. Walls of jasper. Gates of pearl. No sickness. No heartache. No temptation. No sin. Thousands worshipping Jesus. What a beautiful place heaven must be. God, The Father asked Him to leave it all and to go to an earth filled with sickness, temptation, heartache and pain. To go to a place where He would be rejected, scorned, beat and eventually crucified. 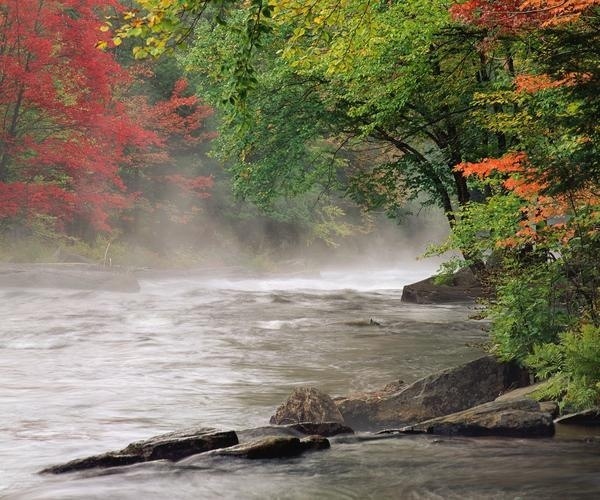 Throughout the Bible we are given beautiful descriptions of a river with fruitful trees growing along the banks of it. This picture of God’s creation is also a beautiful description of our relationship with Jesus. Jesus is that river. He is our source of life. The fruitful trees are us, followers of Christ. We gain life and strength because our roots are connected to Him. To know that Jesus, the River of Life, is supplying our need for survival is humbling. Rooted in Him we can be found not only living but growing and producing fruit. He is the Giver of Life and we are the recipients, flourishing under His care. If we have a desire to see God in His creations then we can learn so much about ourselves and The Creator. We will find ourselves drawing closer to Him, in awe of the beauty and symbolisms of His creativity. A crowd had gathered. In the midst of them was a woman with a blood issue. She knew she needed to just touch Jesus’ clothes and she’d be healed. Jesus noticed when she touched him. He asked who had touched him. Trembling, she came before The Lord and bowed. She was whole. A walking miracle. A crowd had gathered outside of a young girl’s house. She was perceived as being dead. Jesus arrived on the scene. He said she would be healed. The crowd laughed. Jesus told them to leave. The crowd was unable to witness the healing of the girl. When Jesus asked who had been healed the woman humbly bowed herself before The Lord. By doing this she was strengthened and drew closer to Jesus. The crowd mocked Him when he spoke words of comfort about the little girl’s situation. Their initial reaction caused them to be commanded to leave, putting distance between themselves and The Lord. Our initial reaction to The Lord speaking to us not only has an affect on our relationship with Christ but it teaches us about ourselves as followers of Him. Live a life of humbleness. Be willing to lay it all on the line for the Lord. Draw closer to The Lord now so that when He speaks to you your initial reaction won’t be one of disrespect and unbelief. God blesses His people everyday. Sometimes we don’t even recognize the blessings of The Lord. Other times we are well aware of the blessing because we are looking for it. We are ready to see it happen. The army of Israel was preparing for battle. There wasn’t any water in the foreign land. They asked Elisha, a prophet, to ask God for water. Elisha told them to dig ditches and that The Lord would fill the ditches with water from the ground up. The Israelites dug the ditches and the water began to flow. Daily we come before God asking for a blessing. Probably most of the time we just expect it to fall in our laps and that be that. Often times The Lord blesses in that way. But occasionally he requires us to put forth effort to receive a blessing. The Israelites showed God their obedience to Him by doing as he commanded. They dug the ditches. This was also a representation of their faith in God. God took it from there. He blessed in ways that they would’ve never imagined when they first inquired of The Lord. Continue to seek The Lord and His blessings. As you do be prepared to show God that you’re willing to take action so that you can become a recipient of the miracle he has in store you. Beautiful. Precious. Without flaw. These words can be used to describe jewels. God uses them to describe His children. He refers to us as his jewels. Followers of Christ should be found sharing what Christ has done for them among themselves. Christ hears these conversations. Christians should also be found thinking upon the ways of God. God knows our hearts. He has a book where he has written your name. Because your name is found in this book you will be pardoned of the punishment for your sin. How wonderful it is to think that because of our choices on earth we can become as jewels to Jesus in heaven and that one day He will gather us together to be forever with Him. Close out the world. Get quiet. Envision The Lord sitting on His throne in His kingdom looking directly into your eyes listening to you speak to Him. That’s powerful. The Lord we serve is high above all else, using the earth as His footstool. Yet He cares enough about you to look into your eyes and to listen to what you are saying. As you imagined The Almighty God focusing on you notice that you weren’t seeing the trials or tribulations that you may be going through. You were completely focused on God alone. David acknowledged The Lord as God. He was aware of all the turmoil that faced him. Yet David chose to focus on God. His desire to worship Him, seek Him and talk with Him took precedence over everything else that surrounded him. David’s spirit was made confident and peace prevailed when he sought The Lord that was hearing his prayers. Ask The Lord to bring a vision like this to your mind when you become bogged down by the world or pursued by the devil. Focusing on God and the relationship that he offers you can bring you confidence and peace. Because it isn’t just our imagination. It’s reality.